Wedding Hairstyles for Guest – While the bride and her attendants obviously put a lot of thought into how they are going to look on the big day, wedding guests have a special responsibility to show up looking beautiful, too. 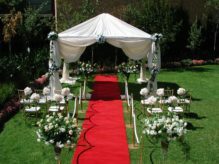 Especially if the ceremony and reception are semi-formal or held in the evening, you will want a lovely yet unique look to stun in the crowd of well-wishers. 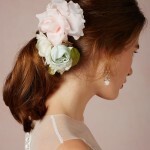 In this post we are going to show you 20 Wedding Hairstyles for Guest, which really deserve your attention. Curly Twisted Updo: If you can’t decide on a look, this is one out of many wedding guest hairstyles that sort of incorporates it all. A braid, side twist, pinned curls and tendrils – what more could you possibly want out of a hairstyle? This will work best on longer hair. Braided Crown Bun: If you have hair that is at least medium length and yet also quite stubborn when it comes to styling, try this look when considering hairstyles for wedding guests. 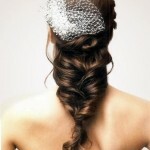 Crowing the head with a thick braid, all of the hair is then gathered into a messy low bun. This style doesn’t have to be perfect, which makes it even more inviting to girls with stubborn locks.